This is a sponsored post written by me on behalf of Dr. Dish iC3 for IZEA. All opinions are 100% mine. The Perfect Way To Practice Basketball! Today I am going to share with all of your basketball lovers out there a new product that automatically returns the basketball to you after catching it on a net and swinging it back at you nicely after. 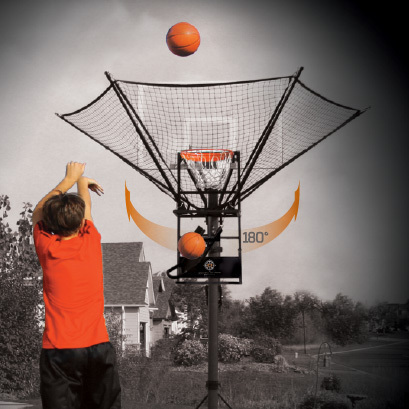 The iC3 shot trainer, basketball training is the perfect way to practice some basketball by yourself without a lot of the unnecessary running around to chase your ball after every shot! This revolutionary system allows you to truly take your time practicing your shots, or even as a small group, without a lot of the wasted time and dangers of the traditional way. Often times I find it really nice to throw on some headphones and go shoot some hoops by yourself to practice and have fun and this system would make it so much nicer. Down to the details, so what all can this magical device do? Well it will help to improve your accuracy and the arc of your shot. Because it is higher than the rim you are basically going to start trying to get your swishes on a lot more than just backboarding it in. It will setup fast with minimal effort or heachache and it will develop some muscle memory as you shoot. The “Dr. Dish creates three additional training machines for various levels of coaches and players. These sleek autoamted shooting machines are infused with technology for more intense, game-like training”. That sounds incredible right? Well what are you waiting for? Perhaps the best way to get yourself acquainted with the iC3 is with some videos! Embedded below is a video of the IC3 so that you can see first hand how awesome this product is. Well guys, if you ever want to match me in a game of basketball or some horse I am super down! Obviously I am a short guy and only played on a team in middleschool as far as organized practice other than just for fun so am not the best but am ready for your challenge! Perhaps if I can go practice on one of these iC3’s… maybe I’ll improve a lot faster. As an entrepreneur I am always watching out for how to be super efficient with my time and as much as I love playing basketball, chasing the ball seriously gets in the way so I don’t go as often as I would like to. Obviuosly that is not the only reason but one annoyance of practicing yourself depdending on the court. If there is a lot of open area behind the basket ball hoop or you shoot a side shot, be prepared to run. This sweet product could change that, as long as you get it within the net… don’t completely aiball! -Josh Bois signing out! I hope to try one of these out soon if not getting my own! In Case You Missed The First Video…. This system is really awesome, look how big the net is so it always catches your shot!